It all began with an acorn. There are some places you shouldn’t disturb, places where history lingers. When Rowan travels to England, she finds a remote village, hidden in the shadow of an ancient forest. Vague warnings from the local people aren’t enough to stop her from venturing into the trees, or from picking up a single acorn. It seemed a simple action. But when a stranger emerges from the forest claiming the acorn belongs to him, Rowan finds herself pulled into something both centuries old and deadly. Clarissa Johal is the bestselling author of paranormal novels, Whispers in the Wood, Poppy, The Island, Voices, Struck, and Between. When she's not listening to the ghosts in her head, she's swinging from a trapeze, or taking pictures of gargoyles. She shares her life with her husband, two daughters, and every stray animal that darkens their doorstep. 5.0 out of 5 starsUnexpected twists! I wasn't quite sure what to expect (other than maybe not reading with the lights out because I'm a baby when it comes to scary stories), but this entertaining page-turner held surprising twists. I enjoyed the main character Rowan's intelligence and independence, and I raced through, wanting to unravel the mysterious (and eerie) circumstances involving the tiny English village of Sheep's Crossing and its residents. I appreciate the underlying message (but I won't say more to avoid spoilers). The author did an excellent job of setting the scenes. It all began with an acorn...so clever. Thumbs up! Loved this story so much. I desperately want the underlying premise to be true. It’s heartwarming but not Pollyanna at all. Good characters and engaging storyline. 5.0 out of 5 starsA New Favorite! Whispers in the Wood has easily become a new favorite paranormal novel. Written with wonderfully descriptive text, it is easy to visualize everything the author packed into this novel. The story takes place primarily in Sheep’s Crossing, a small village in England. For such a small town, this village is filled with large secrets, a mysterious forest, and mischievous children. Rowan gets pulled into the secrecy, not by her own accord, but the townsfolk are reluctant to disclose anything to her. She’s a stranger and the faster she blew through town the better. Rowan is a strong, independent character that isn’t in the best place in her life in San Francisco, CA. While backpacking through Europe, she faces a couple unfortunate incidents that lead her to backpack blindly through the English countryside. It is then that Rowan finds herself on the doorstep of Sheep’s Crossing. Her trip to Sheep’s Crossing will forever change her. The twists, turns, and psychological suspense in the book are phenomenal. The long running ancient elements of the novel give the book a tinge of horror. The book will pull you in and demand that you read the book from start to finish in one setting. I did not give in to the book’s demands, however, as I did have to adult during the timeframe I read the book. This is one of those books that calls to you when you are unable to read. It reminds you that the story is left unfinished. 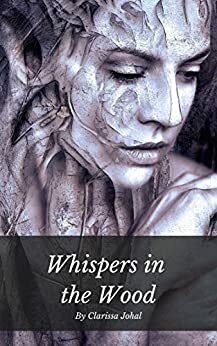 I read Whispers in the Wood at all available times. I usually read 2-3 books at a time. I didn’t with this novel. There was no room in my schedule for anything but Whispers in the Wood. I enjoyed this book from start to finish and HIGHLY recommend it to lovers of paranormal, psychological suspense, and mild horror. The author did a wonderful job with the story, the characters, and the cover.